Normally my daughters don’t want a lot of my knitted items. But my nephew is a different story. That kid is crazy for my hand knits. Last year he saw a picture of the Veggie Baby Hats I knit and wanted one. So I modified the pattern and made a large hat for him for Christmas. I hear that when he wore it to school, my sweet nephew told his teacher that his aunt made it and that “she’s a professional knitter.” Well that’s high praise indeed so when he wants something hand knit, he gets something hand knit. House scarves for everyone (because if I make him one, I HAVE to make his favorite teenagers each one as well). House scarves are pretty simple (you know, two colors alternating, almost as if in a pattern), but I wanted to see if there were any interesting options. 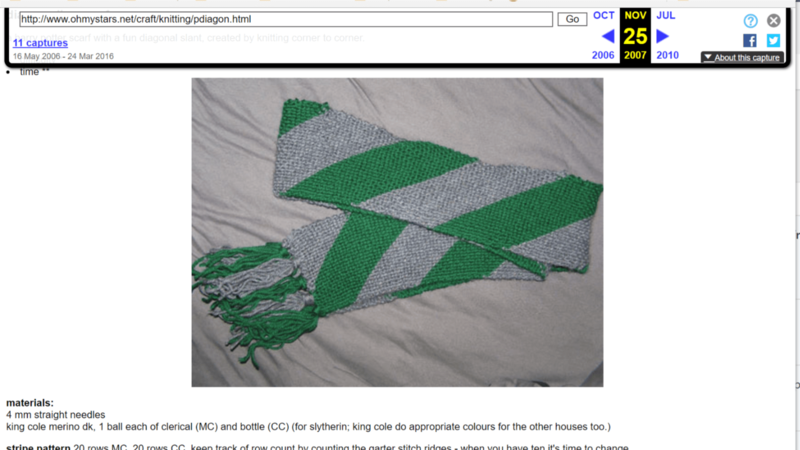 One caught my eye (though the link is to the Wayback Machine as the site seems to no longer be around): It’s called Diagon-Alley Scarf and is knit on the bias. I like the diagonal. It doesn’t hurt that it’s garter stitch. That means that I will be able to knock out three scarves reasonably fast. Now just to find the appropriate colors. Bummer, guess I’ll have to go yarn shopping. Have you downloaded any interesting patterns recently? Let me know and make sure to share the links in the comments!